The race, organised by the Royal Ocean Racing Club, starts from English Harbour, Antigua, with the fleet of 88 boats from 22 nations blasting around a 600 mile course using Caribbean Islands as marks. 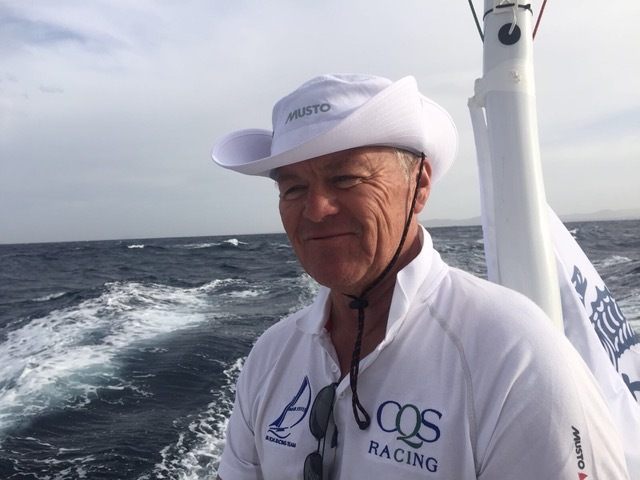 Since arriving in the Caribbean before Christmas CQS has continued the development of their DSS foil, and have the latest version installed for this race. The crew includes New Zealand sailing legends Chris Dickson and Rodney Keenan, plus many of the team that sailed the boat to line honours in the RORC Trans Atlantic Race. 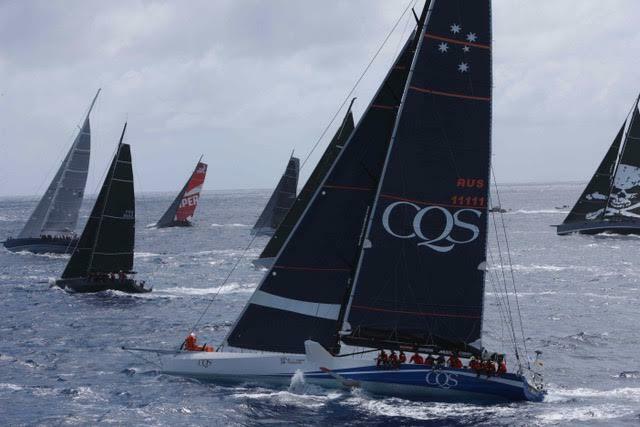 In previous races during this Caribbean season CQS has broken the race record from Barbados to Antigua by an impressive 14 hours. 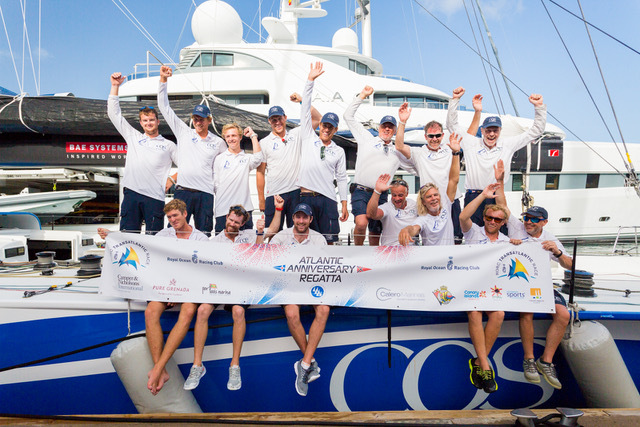 Ludde Ingvall and his team on the super maxi CQS have taken line honours in the Royal Ocean Racing Club’s Trans-Atlantic race from Lanzarote, Canary Islands to St. George’s in Grenada. The sleek blue and white yacht crossed the finishing line off the Port Louis Marina at 12:03:08 having taken 11 days; 0 hours and 3 minutes for the 3,000 mile race, “We achieved what we set out to do. I am proud and happy,” was the skipper’s first reaction. Ludde paid tribute to his team, who had the courage to make an early gamble in the race, by heading south when everyone else chose a northerly course. “It is not easy to go against the rest of the fleet,” he commented, “It took guts to go south. The models said go north, but experience said go south. “It looked really bad for a few days, but the team remained calm and sailed really well, then we popped out into the lead.” They finished with a margin of 545 nautical miles over the second boat, Jochen Bovenkamp’s Aragon. All was going so well until just two days ago when CQS suffered a huge knock down when hit by a 40 knot squall, which blew out sails and temporarily wiped out much of their electronics. A great test of a team is how they react to a crisis, “this team performed brilliantly,” commented the skipper. Ludde Ingvall has selected a trimmed down crew of just fifteen on his super maxi CQS, for the Royal Ocean Racing Clubs Trans-Atlantic Race, starting from Lazarote, in the Canary Islands tomorrow, 25th November. Sharing the skipper’s duties with Ludde is Finland’s Ken Thelen, while there are three watch leaders, Rokas Milevicius from Lithuania, England’s Robin Elsey and New Zealander Malcolm Paine. The 3,000 mile race finishes in Granada, one of the Grenadine Islands in the Caribbean, where the fleet will be hosted by Camper & Nicholsons' Port Louis Marina, and is expected to take about ten days. For the most part Ludde’s crew are up-and-coming young professional sailors, and a great part of his motivation to keep going is passing on his knowledge and experience to the next generation, and giving them a chance to sail big boats. Weather forecasts for the race are showing a strong bias towards a more northerly course across the Atlantic, which is unusual at this time of the year. The fleet should experience downwind conditions right from the start of the race, which could signal at fast passage to Granada. With boats still on the race track of the Rolex Middle Sea Race, Ludde Ingvall’s super maxi CQS is provisionally second in ORC Class 1. They crossed the finishing line in Malta’s Marsamxett Harbour, at 02:51 local time on Tuesday morning in fourth place on line honours. “We had a bit of everything during the race,” said Ludde, “we almost came to a standstill between the Straits of Messina and Stromboli, then we hit 36.7 knots on the way down to Lampedusa. The attrition rate has been high, with 59 boats of the 103 starters forced to retire from the race so far, many with damage caused by the big seas and winds that gusted up to 40 knots during the worst of the storm. This is the first time that Ludde has done the Rolex Middle Sea Race, one of the races on his “bucket list” now ticked off. “I like the Rolex races, they are all classic offshore races that test you,” he commented. The 608 nautical mile race takes the fleet from Malta, north up the east coast of Sicily, then around the Stromboli volcano and on anti-clockwise around Sicily, before heading south around Pantelleria and Lampedusa, then back to the finish in Malta.